Clockparts.com has been an innovator in the Clock Parts industry for over 40 years. Our "Premium LCD Insert with Day/Date and Time Display" is another example of that. This item is a perfect complement to the large selection of analog inserts we currently carry on our site and perfect for our digital clock lovers. Over the years, we have had many inquires and requests for a digital insert. Even more, customers are constantly asking us for an all encompassing insert or fitup with more than just the time. This insert does it all! Not only will the insert give you the time, but the day, month and year! There is nothing like it in the industry. Besides providing all the necessary features, this high end insert has a sleek and slim look with a black matte finish. The insert operates on Two Triple A batteries. In addition changes to the features (time, day, date, year) are made on the back. Instructions are simple and will be provided with your purchase. 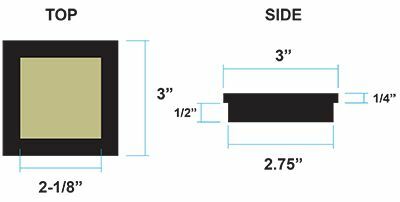 Please check carefully the dimensions of the Premium Insert and complete the clock project of your dreams. Be Creative and utilize our exclusive LCD Insert to make something special for you or somebody you know. Clockparts.com encourages creativity and this item will help you fulfill your clock dreams.